5 Bedroom Detached House For Sale in Redruth for Guide Price £875,000. This is a bold detached granite former vicarage dating back to the 1850s and still retains many of the original features yet has been carefully improved to provide up to date spacious family living. The private driveway form the lane leads to the period columned entrance which guides you to the main front door taking you into the central hallway providing access to the ground floor rooms. The decretive spindle turning staircase, lit buy a large sash window, rises to the first floor. On the ground floor to one side of the hall is a cosy snug , which is a great room with its featured granite lintel fire place, log burning stove and timber flooring give the room its character, plus the addition of a separate cloakroom wc. From the snug you enter the bright and spacious country kitchen fitted with a variety of low level units with a continuous work surface perfect for the chief of the house. The focal point AGA and granite flag stone floor takes you back in time. Adjacent to the kitchen is the useful utility room with space for the appliances, ideal for coats and boots plus a side door which leads out to the side garden. To the opposite side of the hall is the most splendid sitting room with two large sash windows flooding the room with light. There is plenty of space for a variety of furniture to sit and admire the granite fire place at one end of the room. Staying on the ground floor moving through to the rear of the property is a stunning addition. Created to provide extra living space to the main house or offers its own kitchen and bathroom which can be used for visitors or teenagers or large work space, or even as an annex. The large open plan living area with a vaulted ceiling, mezzanine level, exposed stonework, timber floor gives a unique twist to the property. In addition to this room is a modern fitted kitchen with appliances and a separate modern shower room. There is also a separate entrance door and doors to the garden. To the first floor is a spacious landing providing access to all the bedrooms and family bathroom. There are three spacious double bedrooms and a single bedroom each having a rural view from the sash windows. The master bedroom has an en-suite Jack and Jill shower room fitted to a modern style, while the third bedroom has an en-suite shower room. There is a luxury fitted family bathroom with under floor heating, an oval bath, inset sink to fitted cupboards, wc, and corner shower cubical finished with polished wall and floor tiles. To the rear of the property is a detached garage plus further stone outbuildings. Beyond the gate is the rest of the land with a number of large flat fields set to pasture of approximately 15 acres. The fields can be accessed from a number of separate entrances ideal for dividing the fields if required. At the far end of the land the current owner has planted a large number of trees on a gently sloping area to create a natural space for wildlife to blossom. From here you have beautiful views across Stithians reservoir. The land is a superb addition to the property providing walks and tranquillity plus a wonderful place for the family to enjoy. A long private gravelled driveway sweeps towards the property and provides plenty of parking for several cars. To the right of the drive is a gated entrance to the paddock ideal for horses plus the possibility for a sand school. There is also a detached triple stables and separate barn for storage. Next to the property are the large formal gardens with decorative flower beds, shrubs and trees. The lawn extends through a gap in the hedging to a large secret garden with ornamental granite features, a perfect children's play area or summer garden barbeques for the adults. The property has mains water, electricity and drainage. There is an Oil tank to a oil fired boiler providing hot water and central heating. Please note there is a right of access over the front section of the main driveway for the neighbouring property. There are also several gates providing access points to the fields. 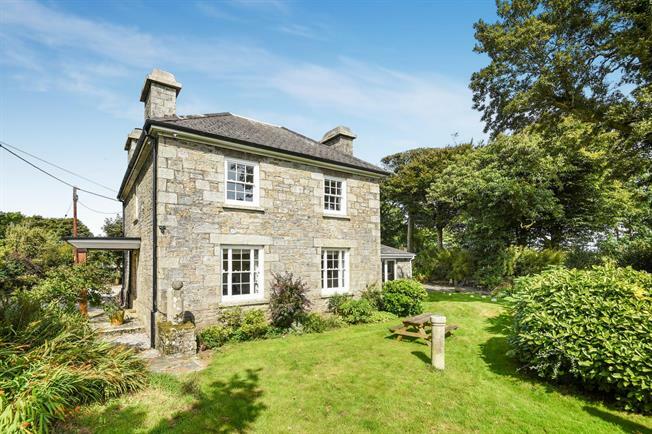 Carnmenellis is centrally located a short distance from the towns of Falmouth, Helston and Camborne and is within easy commuting distance of the City of Truro. Cornwall's principal retail and commercial centre with private and state schools, college, hospitals, leisure and entertainment centres together with a mainline railway station to London Paddington. The harbour town of Falmouth with its excellent maritime facilities and access to the excellent sailing waters of the River Fal and Carrick Roads is approximately 9 miles. The former market town of Helston is 7 miles and is the gateway to the Lizard Peninsula.